Have you visited all of the major sites in the nation's capital, but overlooked the surrounding cities you might have flown into? Baltimore, Maryland, might be the prime spot for your next visit to the Washington, D.C., area. Baltimore itself is a historic city, the second-largest seaport in the Mid-Atlantic and at one time the second leading port of entry for immigrants to the U.S. Famous residents have included Edgar Allan Poe, Frederick Douglass, Billie Holiday and Babe Ruth. 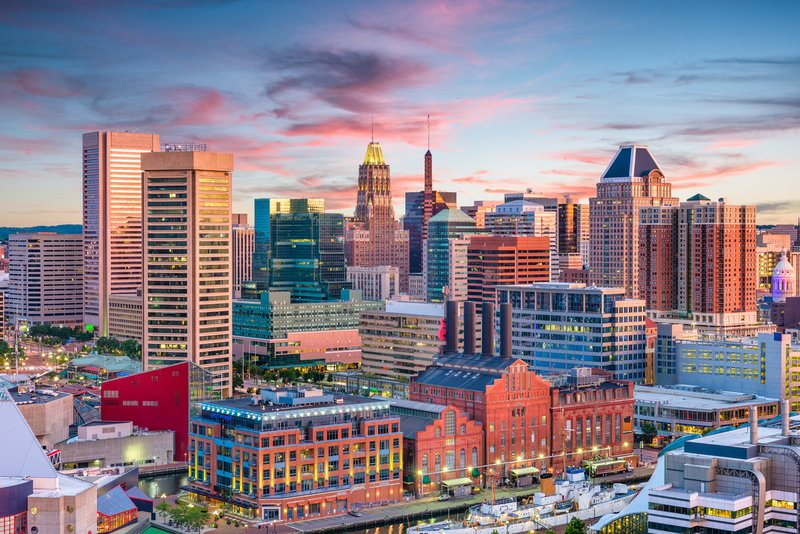 Today, Baltimore is also home to Johns Hopkins University and its world-renowned hospital. Maryland blue crabs fill the local crab shacks, along with some of the trendiest culinary destinations, like the bakery behind the Food Network's Ace of Cakes. Baseball fans will find the Baltimore Orioles in their iconic ballpark at Camden Yards. Fortunately, there are plenty of relatively inexpensive flights between Raleigh and Baltimore on travel site Skyscanner. Here's a list of flights, hotels, restaurants and local attractions in Baltimore to get you excited about your next excursion. The cheapest flights between Raleigh and Baltimore are if you leave on March 1 and return from Maryland on March 3. Delta currently has roundtrip tickets for $159. Delta also has tickets at that price point in February. If you fly out of Raleigh on February 21 and return from Baltimore on February 24, Delta can get you there and back for $159 roundtrip. Regarding where to stay, here are two of Baltimore's top-rated hotels, according to Skyscanner, that we selected based on price, proximity to things to do and customer satisfaction. If you're looking to treat yourself, consider The Baltimore Marriott Waterfront. The hotel has a 4.8-star rating on Skyscanner, and rooms are currently available for $179. There's also the 4.4-star rated The Hilton Baltimore. Rooms are currently set at $135/night. This downtown Baltimore hotel is located adjacent to Oriole Park at Camden Yards and very close to the USS Constellation, the Hippodrome Theatre and M&T Bank Stadium. Other attractions include the National Aquarium and the shops at Harborplace. The hotel is directly connected to the Baltimore Convention Center via an indoor walkway. Don't miss Baltimore's food scene, with plenty of popular spots to get your fill of local cuisine. Here are a few of the top-rated eateries from Skyscanner's listings. If you're looking for a solid place to grab some coffee and dessert, plan to visit Vaccaro's Italian Pastry Shop. "Vaccaro's is famous among both locals and visitors," wrote Daniel. "Located in the heart of Little Italy in Baltimore, patrons flood in to have lunch or pickup a tasty treat with a warm beverage." Another one of Baltimore's most popular restaurants is The Food Market, which has an average of 4.8 stars out of five reviews on Skyscanner. "Chef Chad's menu is to say the least, stunning," wrote visitor Charles. "Service is great." To round out your trip, Baltimore offers plenty of popular attractions worth visiting. Here are a couple of top recommendations, based on Skyscanner's descriptions and reviews. The top-rated visitor attraction in Baltimore, according to Skyscanner, is Wockenfuss Candies. Wockenfuss Candies is proud to be one of the oldest candy makers in Baltimore. It's a family-owned business that is now in its fifth generation of candy making. Then, spend some time at Oriole Park At Camden Yards.